Underneath a vast cavern located in Phetchaburi, lies a 3.7-meter-tall Buddha Statue that houses more than 180 Buddha statues and relics. This cave was used by the Kings of the Royal Rattanakosin Dynasty as a multi-chambered temple and is located 27 metres below the ground. King Rama V ordered the casting of this statue as a tribute to his predecessors, King Rama IV and King Rama III. Opposite to the main Buddha statue are lines of smaller versions of the statue that sit on a rock-sewn platform. From within the main chamber, you can enter the second chamber beyond which, people believe, are three more chambers. TO reach the main chamber, one has to climb up a hill. Important attractions of the city include Wat Pho Reclining Buddha, B T S Skytrain, Rajawongse Clothier, Grand Palace and Wat Phra Kaew. You can also discover other things to do in Bangkok on TripHobo. 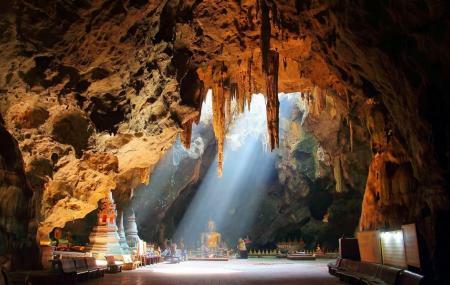 Try the best Bangkok trip planner to visit this Tham Khao Luang Cave as well as many others. Fine Accommodation options like Aim House Bangkok, Pas Cher Hotel De Bangkok, Ibis Bangkok Riverside and Kokotel Bangkok Surawong will meet your requirement of where to stay in Bangkok. How popular is Tham Khao Luang Cave? People normally club together Tham Khao Yoi and Bangkok Wat Arun while planning their visit to Tham Khao Luang Cave. People also prefer to start their day with Tham Khao Luang Cave. The temple is inside the Tham Khao Luang cave. Once arrived, it is needed to walk uphill a bit and then walk down the stair to go inside the cave. Inside the cave, there are multiple Buddha statues and incredible light entering the cave from the opening in roof of the cave. Parking: You can drive and park near the entrance, no need to park below. Many monkeys here, sometimes hey fight would be a bit scarring. Greatest thing here is he holy light, you can truly feel the blessings form the ground. Great cave. Elders come would care about the stairs, it’s about 4 stories height.